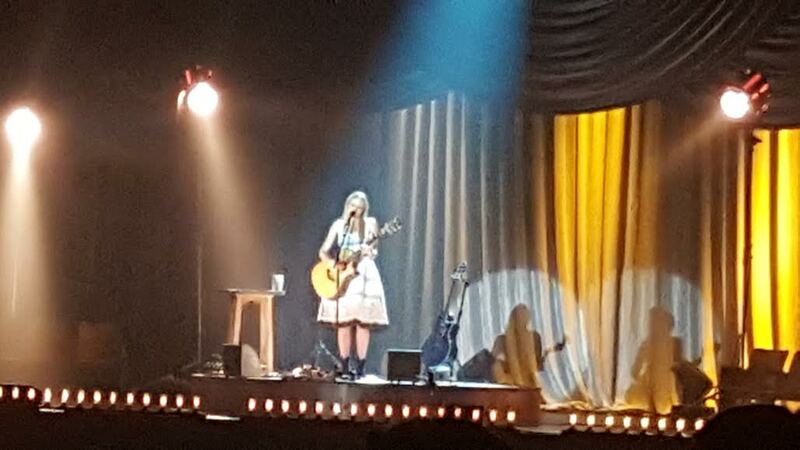 Singer-songwriter Jewel brought her ‘Picking up the Pieces’ tour to the Bethlehem Sands Event Center on Friday night, and those in attendance were treated to an impressive but uneven show. As a singer, Jewel was strong throughout the night. Her voice is as strong and profound as ever. One minute she can hit some truly high notes and then the next she can hit a very low note. Her vocal range, drifting from low to high, is truly one of the more impressive sounds I’ve heard in concert. 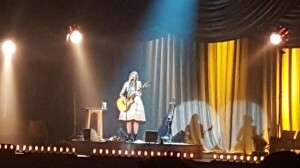 Jewel, who performed by herself with just her two guitars, opened the show with 10 minute plus monologue about her life that seemed like a less interesting version of an old VH1 Storytellers performance. She followed this up however with a very strong a capella version of “Somewhere Over the Rainbow”. Jewel, who is now also an author, seemed at times a little too into promoting her book “Never Broken”, and the self-recorded voice-overs that came throughout the evening were a bit too much. Jewel is an interesting, intelligent, and very talented woman with an interesting personality who just needs to find a better and smoother balance between her story telling and singing. Jewel performed many of her hits throughout the performance including “Hands”, “Standing Still”, and “Foolish Games”. She also performed songs from her latest album, 2015’s “Picking up the Pieces” which she sees as a bookend for her 1995 debut “Pieces of You”. Some of those songs included “Plane Jane”, “Mercy”, and “Here When Gone”. My favorite of her new album was “Father’s Daughter” which was the one song that truly felt like it benefited from her storytelling and became more powerful when she spoke about the story of her father and grand mother. Fans also heard her perform “See Sassy”, a song which she said she was performing live for only the 2nd time in the last 20 years. In all, Jewel performed 18 songs and the show lasted nearly two hours. Jewel came back after her set ended for an encore song where she performed “Chime Bells”. The song gave the audience another glimpse at just how diverse and powerful her voice is as she yodeled her way throughout most of the song. It ended with her rapidly increasing her yodeling until it reached what seemed like a machine gun-speed, so incredibly fast, yet clear. Overall Jewel, is well worth the price of admission and someone I’d like to see live again. Those who have read my reviews in the past know that I really like when an artist acknowledges and engages a crowd. This however was just “too much of a good thing”. If Jewel would cut out half of her monologues in exchange for more music, I think she’d find a better balance. Either way, her unique and robust voice is something you need to hear live to truly appreciate in full. Opening act JD & the Straight Shot were an entertaining and delightful surprise. I didn’t know much about the band beforehand besides a few songs that I listened to on YouTube, but I actually knew more about them than I realized. You see the band is the pet project of James Dolan, CEO of Cablevision, but known to sports fans like me as the owner of the New York Knicks. I’m glad I didn’t really put two and two together before the show (I just thought it was another James Dolan) because it allowed me to enjoy the band for without any preconceived notions. Dolan really held his own on stage and is an engaging lead singer who really knows how to play to a crowd. The band, which besides Dolan includes two guitarists, a drummer, a violinist, and a bassist, were a talented group as well. JD and the Straight Shot mix blues, folk, and Americana styles into a timeless American music sound of their own. JD said that two of the songs they performed “Violet’s Song” and “Perdition” were used for movie soundtracks (August Osage County, and Jane’s Got a Gun, respectively) and I could see why as their music has that Americana infused feel that many movies have used their soundtracks. Their whole set reminded a bit of “O Brother Where Art Thou”, one of my favorite movies and soundtracks. JD also put a creative twist on the song “Nature’s Way”, a Spirit cover that still rings true today. 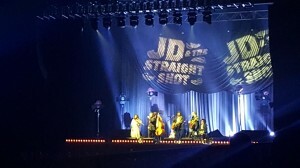 JD and the Straight Shot are touring in support of their newest album “Ballyhoo!”, which was also the name of my favorite song of the set. Dolan in a top hat and glasses, explained the meaning of Ballyhoo and it had a very fun feel to it all. Violinist Erin Slaver also really stood out during this song, dueling with one of her fellow band members on guitar at increasing speeds. JD & the Straight Shot were a very fitting opening act whom I’d like to see a longer set from in the future.